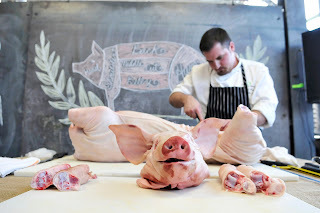 COCHON555 has been pushing consumers to invest in flavor by introducing them to more flavorful breeds of pig. Local sourcing from responsible ranches equals more flavor. Across the country and through the ballrooms and over the counters we go… Locally raised meat grown with purpose and passion is gaining momentum. What can you do? Demand more diverse cuts from the butcher, buy house made salami – it’s like buying direct from the farm. Here is a nice read.